Lisa has been sleeping days and up nights this past week (in part as a reaction to the hot weather), so at the end of her day and the beginning of mine, she took me in to Reno to catch the train to the Bay Area, where I'll be working for the next two weeks. I knew from having checked when I got up that the California Zephyr was running nearly two hours late, so I wouldn't be able to get breakfast on the train. We had plenty of time, so we went to the Sparks Nugget and had breakfast there before Lisa shuttled me over to the Amtrak station. She was in "overtime" and still had to drive the thirty miles back home to Fernley, so she did not stick around. I happened to notice later, looking at old photos of the station, that the parking spaces in front of the station are where the former Virginia & Truckee tracks were located. The V&T terminated at Reno, connecting with the Southern Pacific there and exchanging freight and passengers for Carson City and Virginia City. 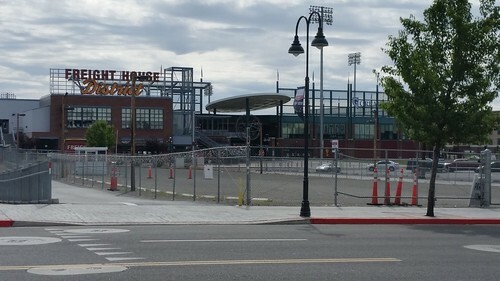 Just east of the station is Greater Nevada Field, where the Reno Aces AAA baseball team plays. It's called the "Freight House District" because of the proximity to the Southern Pacific Freight House in the days where all freight came by rail. I checked my bag (which I rarely do, but there seemed no reason not to do so today), and the staff told me to be back by 9:45. With time to kill, I went for a walk. The railroad tracks were depressed in a trench through downtown Reno in a project a decade ago. This is what it looks like from street level looking down at the passenger platforms. 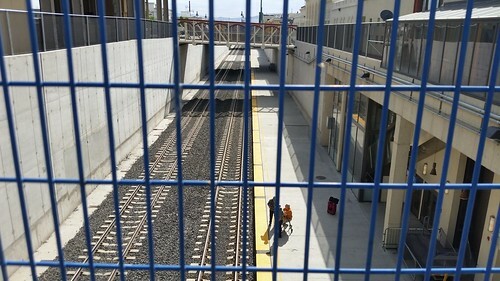 Lisa and I have always thought that, inasmuch as they were tearing up everything to dig that trench anyway, they should have made the passenger platform a third track, so that trains stopping at Reno didn't have to block one of the two main lines. 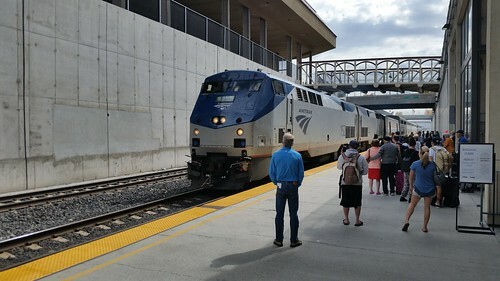 That would have at least opened up the prospect of extending Amtrak Capitol trains from Sacramento and Auburn up to Reno, maybe once a day, with the train being able to lay over at Reno. 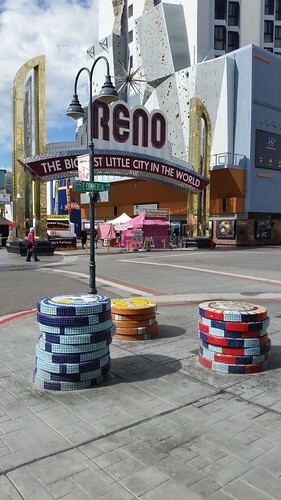 Downtown Reno has some entertaining street art. There was a street fair going on this weekend, but it was before opening, so there wasn't much else to see. I started to go in to the Silver Legacy to get coffee, but the queue was so long that I would have risked missing my train, so I skipped it and headed back to the station. I'm glad I did not rely excessively on the Amtrak revised arrival projection, for the train had made up about fifteen minutes of its delay. I shot this picture as it rolled in, then found my coach (third coach back from the front). A car attendant tagged my seat (I ended up having two seats to myself the whole trip), but after waiting quite a while for a conductor to come scan my ticket, I gave up and went to the lounge car to get that coffee I missed earlier. (I found the conductor later and he scanned my ticket then.) While in the lounge car, I made the acquaintance of docents from the California State Railroad Museum who were in the lounge. Through a program between the CSRM and Amtrak, docents ride from Sacramento to Reno, overnight there (hotel paid by the CSRM Foundation), then ride back the next morning. While on board, they read scripted presentations about this historic stretch of the original transcontinental line. I've been over the route enough that I know many of the stories. I did not shoot a lot of photos today. I've done that before on past trips. Instead, I spent most of the trip sitting back and watching the scenery rather than trying to capture it. 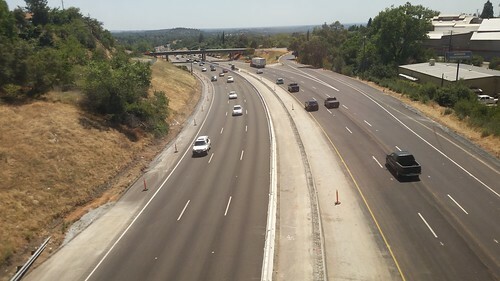 On the other hand, some hours later, as we came out of the foothills, I decided to capture the reverse of a view I've had many times driving home from the Bay Area where the tracks cross over Interstate 80 at Newcastle. 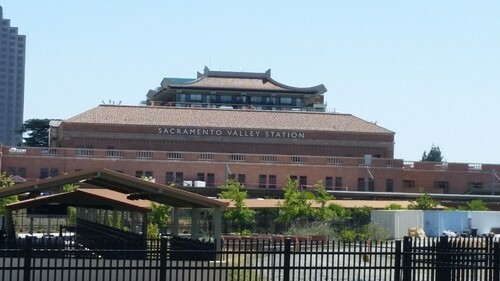 There's a longer stop at Sacramento, and because of the way the platforms have been moved far away from the station (a concession to Union Pacific's convenience to speed freight trains through the area) and the pagoda-roofed building beyond, it gives an odd angle on Amtrak's Sacramento Valley Station. I did not want to sleep through the Sierras, even though I've taken the trip many times now. But after Sacramento, the trip is less interesting and I thought I'd try to sleep, but was unable to do so. Figures. The end of the line for the Zephyr is Emeryville. You can see here that some poor bird had a fatal encounter with the train. (See the locomotive's left front pilot.) This isn't the first time I've seen something like this. Because of the recovery time build into the schedule, the train was only about 30 minutes late into Emeryville. 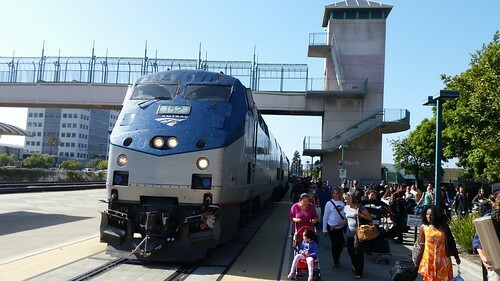 I was able to reclaim my checked bag, make my way over to the Emeryville Public Market (which is under a total renovation and thus only a few food stands were open), grab a meal to go, and get back over to the station with ten minutes to spare before the 5:35 Capitol to Fremont arrived. That was a relief, because the train on which I was actually ticketed was almost two hours later, and I really didn't want to hang around Emeryville that long. I ate my dinner on the Capitol and in good time (early, actually; the train had to wait on its schedule time before departing) they deposited me in Fremont, at the Centerville station where I used to walk many evenings when I lived a couple of blocks away. In this case, I walked the other direction to my mechanic's shop, where by previous arrangement I collected the Rolling Stone using Lisa's set of keys. The brakes have been completely rebuilt and the rear springs (which were sagging) replaced. He didn't have time to get to the fuel tank switch issue, so I'll have to leave it with him again when we go to Westercon and repeat the process of vehicle swapping with Lisa. It was a good trip, and I enjoyed it. I'm sort of glad I'll have to do it again in a few weeks. Although I'm tired, it's not the same kind of tired as when I make the drive, and I do enjoy the train trip much more than driving the 300 miles. If it were a bit more convenient to do so, I'd be tempted to leave the RV in the Bay Area all the time and use the train to get back and forth between home and work stints.